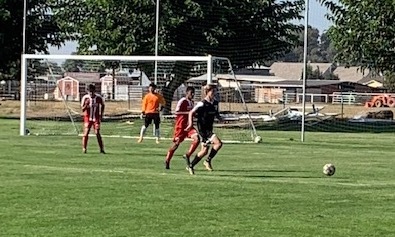 In a matchup between the top two sides in the U15 Boys NPL 1 East, a winner couldn’t be decided between Placer United (4-0-2) and Manteca FC (4-0-1) as the pair battled to a 1-1 draw in Davis. Though the scoreline finished relatively low, it wasn’t for a lack of attacking as both teams forced the goalkeepers in the match into a plethora of saves. Isaiah Martinez began the scoring in the game, hitting in the rebound of his own header in the 60th minute before Alexander Soto drew the teams level nine minutes later and ensure that both teams would remain top of the league and in good standing to qualify for the Champions League. In a game between two undefeated sides, it was all Turlock Academica all the time in a match against previously. 4-0-0 Merced United. Kaleb McDonald opened the scoring just seven minutes in before a second half brace from Fernando Cano and a pair of Merced red cards ensured that Academica would pull to within one point of Merced and two of the top spot in the league. Goals on either side of halftime — one from Ava Medrano and one from Sisi Tafoya — ensured that California Odyssey would get the better of the California Cougars in the “California Derby” this past weekend. With the win, the Odyssey improved their standing in the Champions League table, moving to within two points of the top of the table, though the Odyssey sport a game in hand. Meanwhile, the Cougars dropped to seventh and will need to pick up some positive results to get back in the title race. Coming into the weekend in second place due to a disparity in games played, undefeated MVLA faced a steep test in one-loss Central California Soccer Alliance. But by the time the center referee blew his whistle three times, there was only one team on the field as MVLA put five past CCSA thanks to braces from Leah O’Brien and Amalie Pianim and a solitary. strike from Allie Montoya. The win ensured that MVLA would leapfrog Pajaro Valley and move into first place with a 5-0-0 record.